Solving difficult puzzles in different situations a very clever boy (Ikkyu San) who lives in a boarding school shows his brilliant talent. After a boy is castaway on an island a pink dinosaur hatches. This series follows the adventures of both of them on the island an there friends. A young girl "Perrine" and her mother start a wonderful journey from India to France by a carriage. i remember "99-1" way back when it was first broad-casted on Carlton back in 1994. i taped it a few times and regret throwing away the episodes i did tape at the time. i remember there was meant to be a second series but i think it was cancelled ? 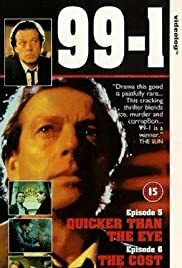 the first series was released on videotape but has since been deleted which i think is a great shame because i am sure there are many people that enjoyed watching "99-1" and would love to own the entire series on tape but finding them for sale is very difficult and although i managed to purchase the first 4 episodes for a reasonable price, i have seen a single tape being offered for £45 which i think is not only extremely greedy but ridiculous. who would buy one videotape with just 2 episodes on it for that amount of money? i wouldn't! i wish the series could be repeated on itv1. I've got only praise for that show, it was good and the characters were good. to say that "leslie Grantham" went over the top in his role as "ex copper Mick Rayner" is like expecting Julian Clary to play a hard nosed bouncer! Mr Grantham was perfect as "Mick Rayner" i cant think of any other male actor who could have done a better job as Rayner.